On the occasion of this year's Hannover Messe, 7-11 April 2014, Bürkert's .water segment will present their latest innovation for monitoring fresh water treatment, thus highlighting once again the company's leading position as a supplier of fluidic systems. With their new online analysis system Type 8905, Bürkert will add a complete, compact and modular water-analysis system to their product range. Bürkert's online analysis system Type 8905 has been designed for waterworks, for the continuous monitoring of treated and untreated waters and storage of the most important measurement parameters before the water enters the supply network. The innovative technology is aimed at plant construction companies and operators of drinking water treatment plants. In the event of disturbances and/or exceedances, the system will be able to respond, based on its programming, for example by interfering with the treatment process or by sending messages to the personnel in charge. With its multiple capabilities, the online analysis system is a great support for any operator of water treatment equipment, optimising settings and controls for various process steps and contributing to the safe and efficient production of drinking water. Miniaturisation and modularisation – two key words during this project. The former could be tackled thanks to the so-called MEMS technology. "Micro-Electro-Mechanical Systems" are miniaturised components that combine logic elements or micromechanical structures in a single microchip. Miniaturisation can go down to the nano level. Sensor chips are integrated in so-called analysis cubes. The basic version comprises five measuring parameters laid out as separate analysis cubes: pH, reduction potential (ORP), conductivity, free chlorine and turbidity. Each cube fits into a housing measuring 7 x 7 x 4cm. The modules have hot-swap capabilities; i.e. they can be plugged in and removed during operation. As soon as a new sensor is plugged into a free slot of the fluidic backplane, it logs into the system and makes its features available to all other modules present in the system. The sensor knows its own setting data that will be required for operating menus, configurations and its specific functionalities. Users in the field can operate the system and/or individual modules using a 7'' touch display available. It also contains all the electronic modules required for control and for connecting to the various technical processes. In addition, it is possible to connect a PC to the system, via USB cable, which provides even more functionalities for programming and configuration. 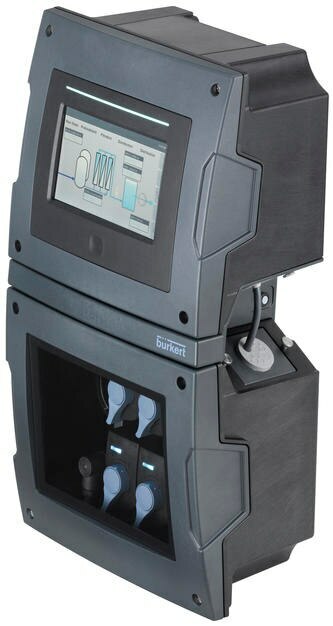 Integrative platform for monitoring all processes Bürkert will continue to develop more analysis cubes for the online analysis system Type 8905, covering more measuring parameters. Thanks to its modular design, the electronic control capabilities of the system can be extended as needed, adding more functionalities or communication capabilities. The fluidic backplane is the interface where all analysis cubes are connected to the water flow in parallel. That means all fluidic elements continue to operate without interruption, even when individual analysis cubes are exchanged. In the event that multiple water flows need to be analysed, or additional measuring sensors integrated, it is possible to switch on several fluidic backplanes in cascade and then operate them using one single touch display. Bürkert's engineers all share the vision of looking at things from surprising new angles in order to come up with new, inspiring answers. Once again, this approach has led them to a completely new technology: Type 8905 now integrates five analytical systems that are usually five different devices, often from different manufacturers, in one compact, extendable platform that is smaller than a beverage crate.